A car dealership in London has given the world’s most expensive car the world’s most expensive polish. 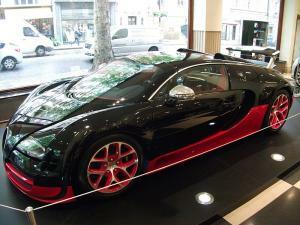 The Jack Barclay showroom in Mayfair spent £3,000 to add a new lacquer coat to its Bugatti Veyron Grand Sport Vitesse. Worth £2.1 million, the west London dealer wanted to ensure the supercar had the paint to match so embarked on the costly, eight-hour process that uses microscopes to spot tiny imperfections. If a dealership is willing to go to such lengths to ensure the absolute perfection of its vehicles then it is imperative they take similar care when it comes to sourcing motor trade insurance. High value cars like this will always attract the attention of thieves so a comprehensive combined motor trade insurance policy is essential to make sure that both the vehicles and the premises on which they are stored are protected from any damage or robbery. The sports car came to the Mayfair-based showroom from Shanghai after it had been on display at events around the world, the Daily Mail reported. Ahead of its sale, the new owner wanted to give it a touch up so decided to give it a state-of-the-art polish. The service, which uses ultrasound and microscopic sensors to target any slight flaws in the car’s surface, can take up to 60 hours sometimes. Derek Bennett, general manager of the Jack Barclay showroom, said: “I have never seen anything like it."